With Square, you can use Card on File with the Square Point of Sale app and Square Invoices to process recurring or subscription-type payments. If the customer already has a payment card(s) saved to their directory profile, choose the card to be charged from the Invoice Method dropdown. If you’d like to let your customer opt in for Automatic Payments using Card on File, toggle Allow Automatic Payments on. This gives your customers the option to securely save their payment card on file and be charged automatically for each invoice within the recurring series. Your customer’s card will be automatically charged according to the series’ schedule. Select the start date, the recurrence frequency, and the end date. Select the + sign from the navigation menu > tap Recurring Invoice. Tap Add Customer > create a new customer or add one from your directory. Tap Add Item or Discount to add items from your item library. Once added, tap the item name to adjust quantity or add a note. To add a discount to the entire invoice, tap Add Item or Discount and select an existing discount from your item library. Under Invoice Method, select if you’d like the invoice emailed to your customer or if you’d like to share the URL with them directly. If your customer already has a card saved on file, you can select it as the payment method. Under Frequency, select Recurring and select how often this invoice will be sent out, as well as end date. Select the Start date for your invoice, as well as a Due date for each invoice. If you’d like to let your customer opt in for Automatic Payments using Card on File, toggle Allow Automatic Payments on. This gives your customers the option to securely save their payment card on file and be charged automatically for each invoice within the recurring series. Your customer’s card will be automatically charged according to the series’ schedule. Toggle on Schedule Payment Reminders and enter a custom message for your customer to receive a notification when payment is due. Click Add Reminder. Add custom invoice details, such as a title, custom invoice ID to match your records, and any additional emails to be copied. Add a custom message for this invoice and click Save. Toggle on Request Shipping Address to make entering the customer’s shipping address mandatory. You can also toggle on Allow Tips to add the ability to add tips to the invoice, and Allow Customer to Save Card so customers can save their card when paying the invoice, so you can charge it for future invoices. Once finished, you can Preview what the invoice will look like on your customer’s end, Save as Draft, or Send. From the navigation menu, tap Invoices > Create Invoice. Under Frequency, select Recurring and set the start date, recurrence frequency, and the end date. If the customer already has a payment card(s) saved to their directory profile, choose the card to be charged by tapping Invoice Method. If you’d like to let your customer opt in for Automatic Payments using Card on File, toggle Allow Automatic Payments on. This gives your customer the option to securely save their payment card on file and be charged automatically for each invoice within the recurring series. Your customer’s card will be automatically charged according to the series’ schedule. Tap Schedule or Charge if sending immediately. Note: Recurring invoices are sent at 10:00 a.m. according to the time zone in which the series was created and does not automatically adjust during Daylight Saving Time or if your business changes time zone. For example, if a series was created while in Pacific Time, then the business moves to Central Time, recurring invoices from any series created in Pacific Time will be sent at 10:00 a.m. Pacific Time, not Central Time. When your clients receive the invoice in their email, they can pay you securely online. If you have toggled Allow Automatic Payments on, your customer can check Save my card on file with (your business name) to save their payment card on file and be charged automatically for each invoice within the recurring series. If their card was already on file, it’s charged automatically. Your funds will be deposited according to your deposit schedule. Note: You’ll pay a fee of 3.5% + 0.15 cents each time you complete a payment with Square Invoices using a card on file. You will be able to duplicate your recurring invoices which allows them to quickly send an invoice with similar details to another buyer. Sign in to the Invoices section of your online Square Dashboard > Recurring. Select the invoice you’d like to duplicate > select Duplicate at the bottom. Select the invoice you’d like to duplicate > select Duplicate. Edit, end, and manage a recurring invoice series from your online Square Dashboard and the Square app. Select an active invoice. From here you’ll be able to edit or end a series. Tap Filter > Active Recurring Series > select the series. Tap Edit or End Series. From here, you can edit or end the selected series. Please note: The ability to edit the next invoice in a series is only be available on your online Square Dashboard. You will be able to view the invoice edits made from the app, but you won’t be able to make any edits from your mobile device. 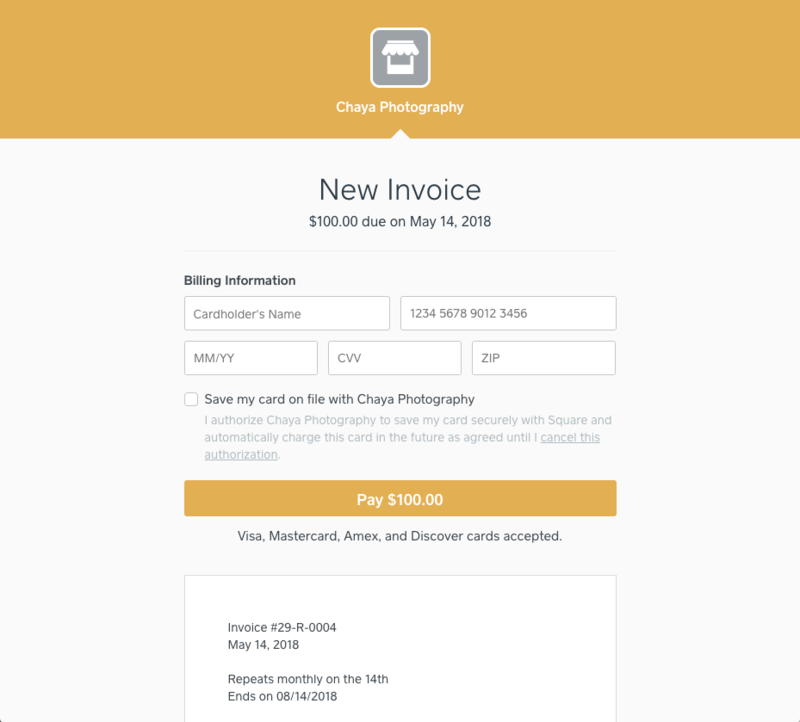 Learn more about getting started with Square Invoices.